Archery is as old as Old Nick. The oldest bows to have been found date back to about 2000 BC and bows are almost definitely older than that. Archery is so old that no-one knows where or when the bow and arrow was invented. It has always been used in hunting and warfare. Buddhist monks in the Far East have utilized archery in their martial arts regimes for centuries as well. Archery is even now being used by some tribes around the world for hunting purposes and many millions of ordinary people practice archery for recreation. Buddhist monks still utilize it in their meditation techniques. There are essentially three types of archery recognized: primitive, traditional and modern archery. Traditional archery includes such bows as the longbow and the recurve bow. Bows of both types have been found dating back to 2000 BC. It appears that the longbow was more common in northern Europe and the recurve bow was more widespread in southern Europe and east from there all the way to Japan. The modern compound bow can achieve a heavy draw weight by expending relatively little physical strength compared with traditional bows by the use of a set of pulleys or cams, however still a lot of people prefer to use traditional bows. People seem to want to get back to the root of archery. Longbows are very basic items, traditionally manufactured from one piece of yew or ash. 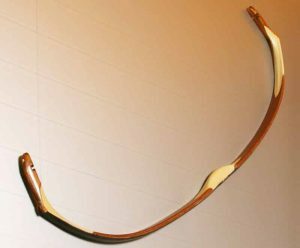 Recurve bows could also be made from one piece of wood, but more often, the tips would be made from wood and horn or bone. Remember that the tips of a recurve bow point to the front when the bow is unstrung. Because of the recurved tips, a recurve bow is more powerful than a longbow weight for weight or inch for inch, but recurve bows are normally quite short, so the standard longbow is much more formidable than the average recurve bow. However, both models of bow take quite an amount of bodily strength to draw them to full power and hold that draw to take aim. This sequence of drawing and holding without shaking or trembling takes a lot of strength and concentration, which normally has to be acquired. It can take years of training to master traditional archery. The British longbow men of the 14 th and 15 th centuries trained all their lives. In fact, Henry VIII made it law that all English and Welsh men had to train with a longbow at the butts every Sunday aiming at targets at least 220 yards away. These days, 90 meters (100 yards) is about the furthest archers shoot. It would often take ten years to become this skillful, but some archers could cast an arrow 400 yards and more. In order to cast an arrow that far, traditional longbows used in warfare had a draw weight of between 160 and 180 lbs, which would send a three ounce, armour-piercing arrow about 300 yards. Not many men could pull a bow like that these days These days, a typical draw weight for a longbow would be 100 lbs and for a recurve something over 60 lbs.